"I CERTAINLY didn't set out to create a language that was intended for mass consumption," says Guido van Rossum, a Dutch computer scientist who devised Python, a programming language, in 1989. But nearly three decades on, his invention has overtaken almost all of its rivals and brought coding to the fingertips of people who were once baffled by it. In the past 12 months Americans have searched for Python on Google more often than for Kim Kardashian, a reality-TV star. The number of queries has trebled since 2010, while those for other major programming languages have been flat or declining. The language's two main advantages are its simplicity and flexibility. Its straightforward syntax and use of indented spaces make it easy to learn, read and share. Its avid practitioners, known as Pythonistas, have uploaded 145,000 custom-built software packages to an online repository. These cover everything from game development to astronomy, and can be installed and inserted into a Python program in a matter of seconds. This versatility means that the Central Intelligence Agency has used it for hacking, Google for crawling webpages, Pixar for producing movies and Spotify for recommending songs. Some of the most popular packages harness "machine learning", by crunching large quantities of data to pick out patterns that would otherwise be imperceptible. Moreover, Pythonistas who take their language's supremacy for granted should beware. 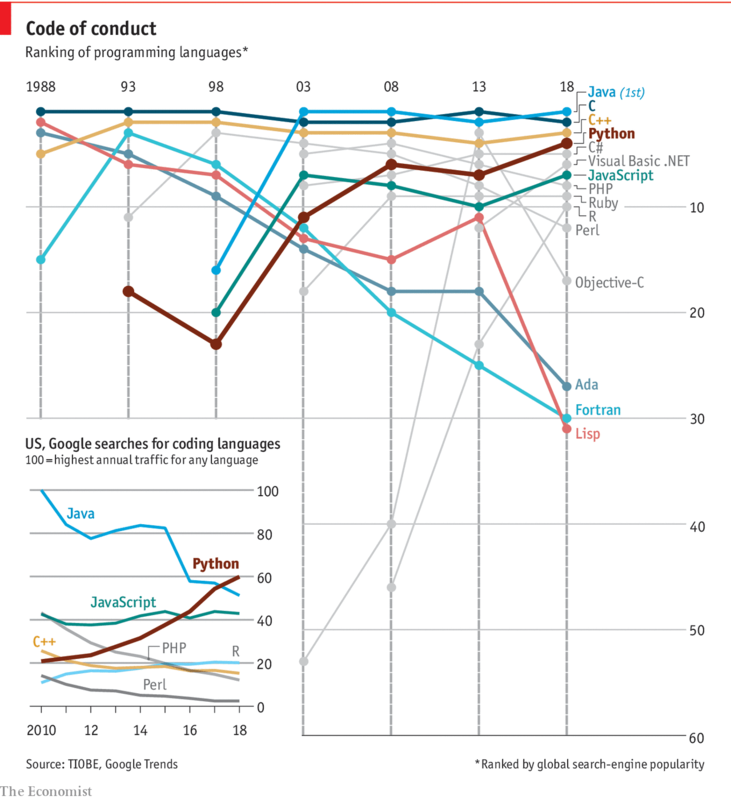 Fortran, Lisp and Ada were all highly popular in the 1980s and 1990s, according to the TIOBE index, which tracks coding practices among professional developers. Their use has plummeted, as more efficient options have become available. No empire, regardless of its might, can last forever.